The second day here at TED was an amazing day with talks ranging from Serena Williams to the Pope (in just one of the four sessions). There were so many good talks today that I'm going to have to leave some of them out entirely. First, one note on the photos. TED this year strongly discouraged the taking of even non-flash photos during the sessions. They instead asked folks to use the photos they would post on Flickr. So, most of the photos today are from there and are not ones I took. I noted each of those with "(TED photo)" to try and give the proper credit. The day started at 8:30am with a session titled Our Robot Overlords. Unfortunately, the jet lag got to me and I overslept. 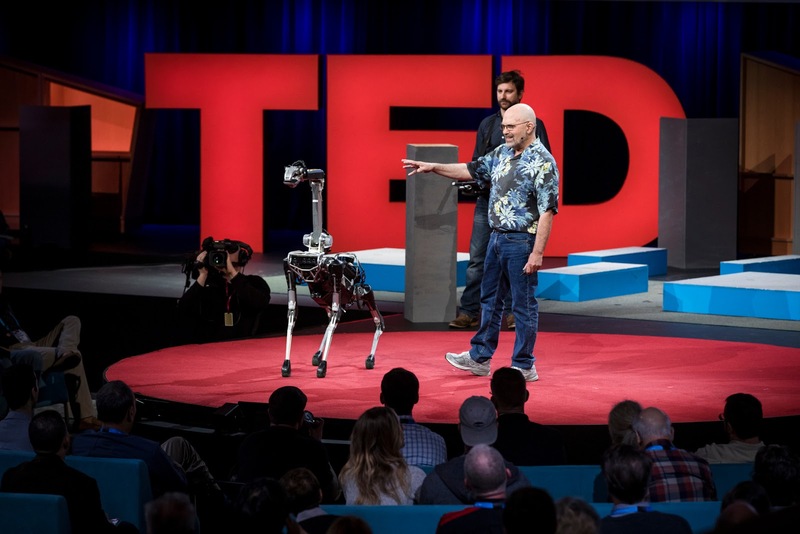 I still managed to get to the session just as the first talk started with Boston Dynamics' robotic dog walking onto the stage. The fun was just getting getting under way! The session included a number of interesting talks. Tom Gruber from Apple talked about how AI, such as Siri, should strive to enhance humans rather than replace them. He spoke of living digitally mediated lives where personal assistants would monitor everything we saw, read, and did and could then augment our memories. That is very attractive to me, but he did not talk about the downsides of such technology. The session included a number of other solid talks such as Noriko Arai describing an AI her team created to take the University of Tokyo entrance exam. Radhika Nagpal explain her effort in developing algorithms and robots that can produce swarming behaviors akin to those of fish and birds. 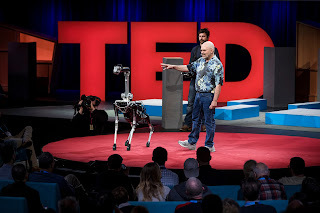 Marc Raibert showed videos (many of which I had seen) on a number of Boston Dynamics robots. Todd Reichert told of the newly announced Kitty Hawk Flyer. Joseph Redmon demonstrated his work with Darknet and YOLO (You Only Look Once) in machine learning and image recognition. Stuart Russel gave his thoughts on how better to create AIs that would not be detrimental to humans. The day next included a series of talks in Spanish in a smaller venue than the main stage talks, called TED en Español. Fortunately, they provided simultaneous translation because after two weeks in China, my ear for understanding Spanish is even worse than normal! The session had a few really moving talks. The two that stood out to me were the ones by Jorge Ramos and Ingrid Betancourt. Ramos told of his experiences being censored as a journalist 30 years ago in Mexico. He then told of his attempt to cover presidential candidate Donald Trump. He showed a video of being kicked out of a Trump press conference in Iowa during the primaries. While Ramos did speak out of turn, the looks on Trump's face and the hateful things Trump supporters/staff said to him afterwards were heart breaking. No one should be treated like that, especially not American citizens in America. Betancourt, a former Colombian presidential candidate, told of her six years in captivity to FARC guerillas. The talk was very moving. She gave three lessons from her time--decide on guiding principles, build trust, and develop faith. She emotionally described how her experiences ultimately led her to God. 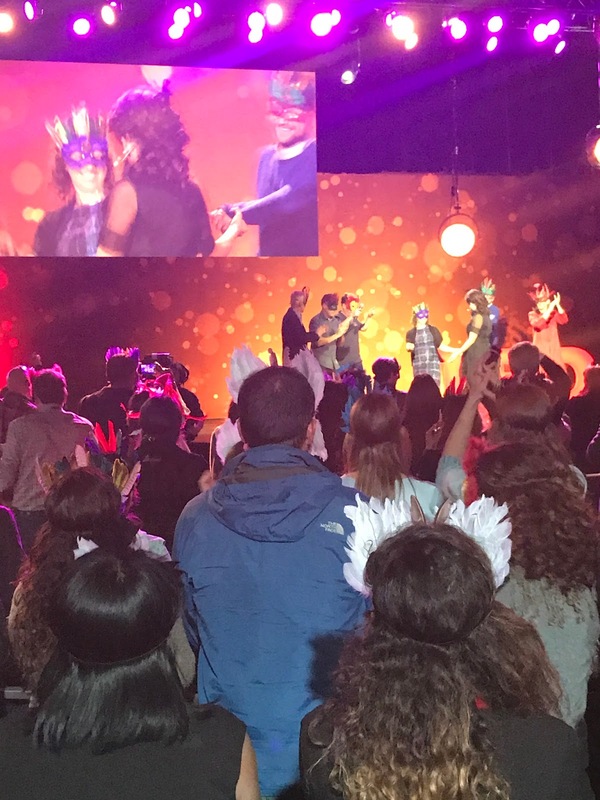 The session ended with a fairly useless talk on the value of play in humans and primates that concluded with everyone wearing masks and dancing. OK, I put on the mask briefly, but didn't join the conga line. Some things are just too far outside my comfort zone! That, coupled with the talks being in Spanish and the host hugging every speaker gave the session a very different feel from most TED sessions! 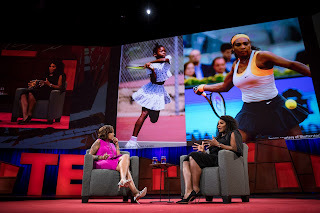 The second session of the day was one of the best ever at TED. One of the speakers was Rutger Bregman on a basic income guarantee. He disagreed with Thatcher's famous quote, "Poverty is a personality defect." While many of us would not agree with that quote, that is certainly how we write our policies. Studies showing that instead of lack of intelligence causes poverty, poverty lowers IQ. One study of sugarcane farmers in India showed a 14-point IQ difference before and after they received the annual income from selling their harvest. He also discussed Dauphin, Manitoba and the 5-year-long Canadian experiment there with a basic income guarantee. The experiment was from the 1970s, but the data was lost for 25 years. Recent analysis of the data showed very positive outcomes without the expected negatives like people quitting their jobs to "live on the dole." I'd read about this experiment before and still wonder why it gets so little press. Bregman concluded with the claim that implementing a basic income guarantee in the US would cost $175B per year. I have plenty of concerns and doubt everything is quite as rosy as he portrayed it, but given the coming job displacement by technology, I think this is something well worth looking into. The session also included a talk by Vanessa Garrison and T. Morgan Dixon. They gave a moving description of their efforts to fight obesity among African-american women through walking. They quoted statistics such as half of African-american girls will grow up to have diabetes. 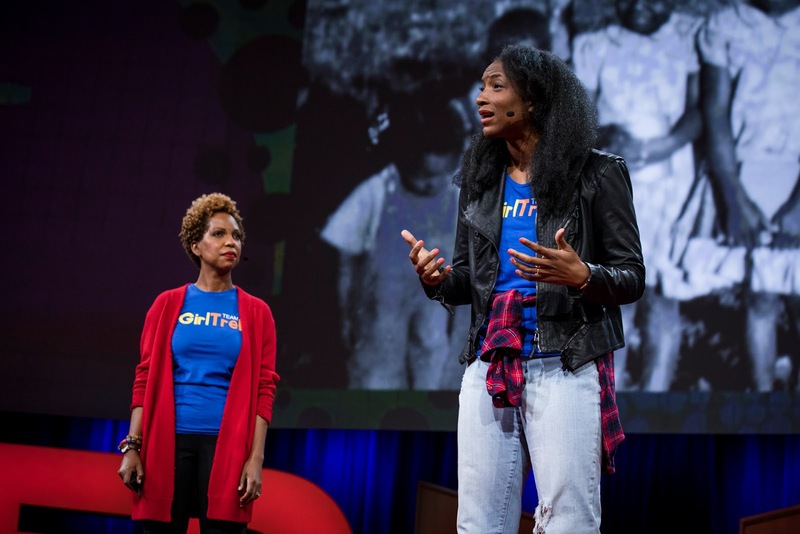 Their program, GirlTrek, is aiming to reach one million women to walk regularly in their neighborhoods. They see benefits well beyond their individual health in those neighborhoods. The two women also did two things of personal interest to me. First, they showed that it is possible for two people to speak together on the TED stage. (You can probably guess why that would matter to Mark and me!) They also opened their talk with a brief prayer, something I had never seen before in ten years of attending TED. I spoke to each of them afterwards, told them that, and thanked them. They each said that they had gotten conflicting advice on whether to start with prayer, but decided they had to. The session also included good talks such as Jack Conteon on how the Patreon platform can provide a way for creators (artist, musicians, etc.) to get paid. Ray Dalio, hedge fund manager, spoke on his notions of radical transparency and algorithmic decision making. Sarah DeWitt of PBS Kids Digital spoke on the unexpected idea that tablet, phone, and computer screens can be good for children. Martin Ford talked about how the impending AI (machine learning) revolution will decimate the job market like no technology before it, the consequent need for a basic income guarantee, and the resulting possible loss of meaning and fulfillment in people's lives. The third session of the day was maybe even better than the second. 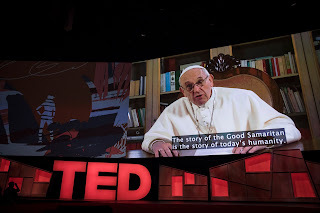 It included a surprise talk by the pope (already posted). Yes, that pope. Pope Francis gave a very good (though pre-recorded) talk that exhorted people to get beyond themselves and work with others to create a "revolution of tenderness." In many ways, his talk shared similarities with yesterday's talk by Rabbi Sacks. Pope Francis, however, was much more willing to talk about God. He did an excellent job of using Jesus' Parable of the Good Samaritan to illustrate his point. So far, this TED has had more mentions of God than any in my memory. The session also included Atul Gawande (whose books I have thoroughly enjoyed) speaking on how professionals can improve well into their careers. He contrasted the training of professionals (go to college, learn a skill, and then use it) with that of athletes (go to college, learn a skill, and spend a career being coached). He spoke of interviewing the violinist Itzhak Perlman and learning his wife Toby's had acted as his lifelong coach. He then told of how he had grudgingly hired someone to coach him in surgery. He was shocked at how many good tips his former surgical professor gave him. He concluded with how coaching had positively affected the delivery of children in hospitals in Uttar Pradesh, India. I came away wondering how I might use coaching in my life and job.